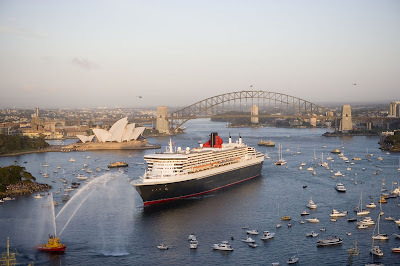 Carnival Australia has just announced that Cunard's Queen Mary 2 will make Australia her "home away from home" in 2012 with a world first 'Royal Circumnavigation' to depart from Sydney on 14 Feb 2012. The voyage will see QM2 return to Sydney, Fremantle, Adelaide and the Whitsundays, as well as making maiden calls at Cairns, Melbourne, Darwin and Brisbane. Fares for the voyage will be available ex Sydney, Fremantle and Adelaide, with Carnival Australia ceo Ann Sherry saying that it will deliver an "economic windfall" for Australia. More information in today's Travel Daily and tomorrow's Cruise Weekly.